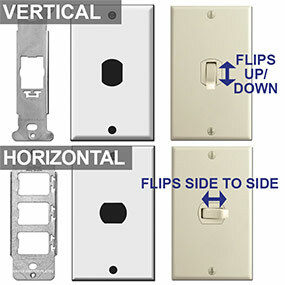 Shop switch plate straps, metal brackets, mounting rings, and exclusive hardware solutions for installing electrical outlets and light switches in electrical wall boxes or for covering devices with wall plates. Find electrical devices and matching light switch covers in 400 sizes to get your project finished. Kyle Switch Plates carries 2 different mud rings for mounting electrical components in the center of a 2-gang box. Note they only work with specific boxes - be sure to check the type and measurements of your box. 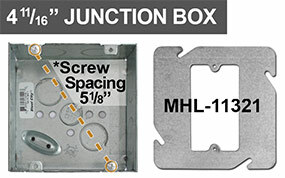 Use the MHL-11221 mud ring if you need to place an electrical device in the center of a 4" x 4" junction box. 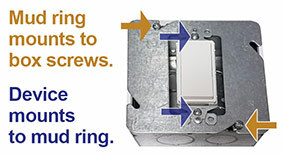 Note that the mud ring aligns with the box's screws (orange arrows). The device mounts into the ring (blue arrows), and the wall plate will mount to the electrical device. 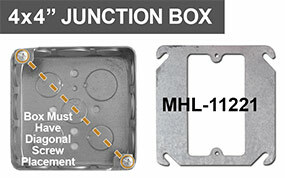 For 4-11/16" boxes, use the MHL-11321 plaster ring to center a device. 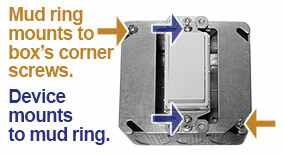 The mud ring must match the screw spacing of the box to mount into place (orange arrows). Then, the device can mount to the ring (blue arrows) and get covered with a switch plate or outlet cover for centered devices. Note that Despard electrical devices - including switches, pilot lights & outlets - can be mounted vertically or horizontally. Choose the correct strap for the orientation that you need. 1 Vertical Despard Strap (holds 1 switch in a 1-gang box) for a single vertical despard wall plate. Be sure to note the orinetation of the wall plate covering the switches. 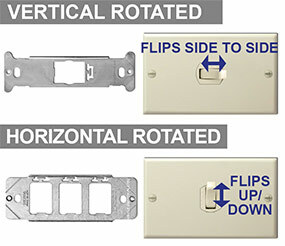 For plates installed "sidways", the direction of the switches in a horizontal or vertical strap changes.